The first Quest Club BD competititon of the year for the Collective TeamQuest riders was held at Stretcholt Equestrian Centre in early February. Collective Daydreams won the BYRDS Team competition with Lily Williams-Musitano scoring 66.74% on Fleur, Lara Denyer & Logan scoring 66.54% and Meggie Dury & Danny scoring 65.1%! Collective Dreams came 3rd with Grace Churton scoring 66.7%, Poppy Williams scored 63%, Lily W-M and her second ride GB scored 62% and Phoebe Crossman with 61.7%! So far Collective Daydreams are leading the way on the South west region leaderboard! Meanwhile at Curls Farm, we welcomed back Tony Hobden from Equidance to film the floor plans for several of our liveries and to start arranging their music – it was a brilliant day, and we are very excited to hear the final versions! To help celebrate Valentine’s Day, we ran a little competition on fFcebook to see what everyone else loves. Thank you to everyone who took part, there were some brilliant responses! Well done to Jane Allerton who won a Baleno Sally gillet, a Le Mieux saddle cloth and training voucher! 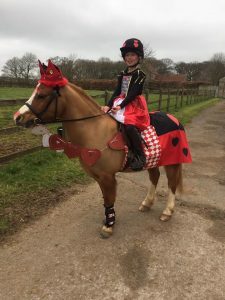 Half term was busy for some of our younger riders. Our Valentines themed afternoon of Gymkana games saw some superb fancy dress – including a ni nja riding a dragon! 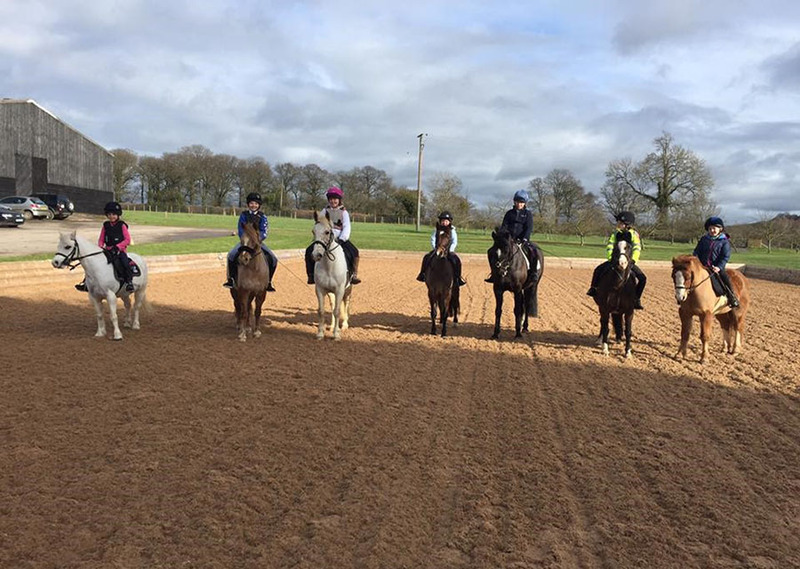 Plenty of fun was had by all the riders, as well as their pony club game skills getting rather good (and speedy!). They also enjoyed a day with Liza having a dressage lesson and a jumping lesson with lot of cake in the middle! Jonny and Alex enjoyed a weekend away in New York to celebrate Alex’s 21st birthday, they came home with the very exciting news that they are engaged! Congratulations to them both! Whilst they were away, Liza held another busy weekend pole work clinic – the Banwell and Mendip Farmer’s Pony Clubs also came to use the poles to work on accuracy, control of the outside shoulder and impulsion! Liza has finally had the cast off her foot, and the crutches have been abandoned again! She is hoping to be reunited with her stirrups very soon! 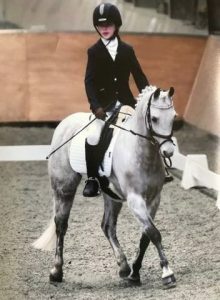 Antonia Wills returned to host a saddle fitting clinic, as well as a jumping clinic with Equestrian Training South West. She brought the exciting news that Alex is now supported by Amerigo saddles! On the yard, we welcomed Harriet Mann to the team, with her young mare Nala. also Donald Fraser has also joined the team with his young horse Midnight. A former yard manager at Talland, Donald has recently returned from working in Germany – he brings plenty of experience to the team having groomed and travelled many horses around the world, including at the Rio Olympics. With spring just around the corner and horses back in the fields, the team are looking forwards to some warmer weather! If you are looking for some inspiration to add to your schooling sessions whilst we are waiting for Spring, have a look at our Facebook page – This months videos include tips on riding medium canter as well as developing focus and balance.